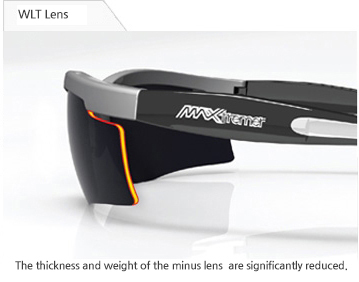 Utilizing the WLT freeform technology, MAXtremer Rx lense created a fully customizable prescription sports sunglasses for those who need corrective vision. WLT freeform technology uses state of the art methods and scientific production system which secures wider vision while providing a clearer field of view. Additionally, it eliminates distortion caused by a high curved frame, while maintaining a comfortable position of wear due to minimized the lens thickness. Area with the most accurate power that flexibly compensates for the lens power, frame size and wearer's adaptability. Region outside the optical zone that slowly changes in power, similar to a progressive addition lens. Area outside the transition zone that will get cut out during edging to be put into the frame. When wearing high curved frames, the area that falls outside the optical zone will result in blurry vision; however, this area is not within the visible zone so it will go unnoticed by the wearer. WLT lens is a special design that compensates for power errors and prism. ■Due to the extreme tilt of high curved sunglasses, the optical axis gets distorted which results in incorrect power and prism. Through the development of a specialized software, WLT lens is compensated for the pantoscopic tilt, the wrap angle, vertex distance, fitting height, prescription power, and other individual parameters resulting in the differentiated MAXtremer design. Corrective conventional lenses in high curved sunglasses induce dizziness and overlapping vision causing great discomfort to the wearer. 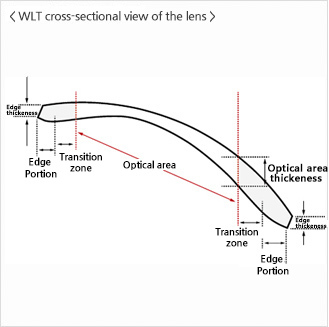 However, the WLT lens provides a comfortable and wide vision to the wearer by reducing peripheral distortion and minimizing variation in power towards the edge of the lenses. Ideal for sports acitivities requiring speed and much movement. WLT렌즈 도수, 두께, 비중에 관한 표입니다. By focusing the wearer's eyes movement, the WLT freeform technology optimizes dynamic vision and reduces peripheral dizziness ensuring natural vision and comfort even during long period of use. ※ This is a medical device, please use caution and read all instructions carefully.